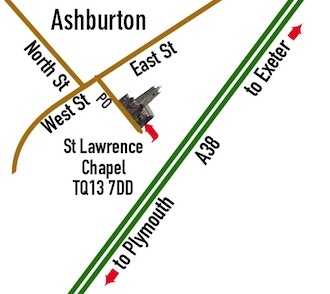 Concerts are normally in St Lawrence Chapel, St Lawrence Lane, Ashburton, TQ13 7DD (map, directions, parking and local eateries below). Tickets are always £10 with a £5 concession to anyone who needs one, that's anyone for whom £10 is too steep. If you can afford the full price, please offer it. We have no other funding, so ticket receipts are all that pay to put these events on and pay the musicians. Tickets are normally available in advance here on We Got Tickets (there's an extra £1 booking fee there) or in person at the Silver Lion Jewellers in North St, Ashburton. This site is often out of date. The Facebook page facebook.com/ashburtonlive is a better bet. Even better is being on the mailing list. I send out information about gigs in and around Ashburton by email every few weeks. These include 'Ashburton Live' gigs, plus other things I'm involved in, plus other interesting live music events I hear about in this corner of South Devon (of which there are probably more than you'd imagine). Sign up on the right. I won't share your address with anyone else, and every mail contains an 'unsubscribe' link. Join the Ashburton Live email list. Put your email address here. We promise to look after it. This is looking like a bumper year, particularly for jazz in Ashburton. Artists already scheduled to appear include: Liane Carroll, Remi Harris, Emily Saunders, Martin Speake, Liam Noble, Jonathan Gee, Jon Shenoy, Rob Terry, Will Butterworth, Maciek Pysz and Nic Meier & Pete Oxley. More info to come about all these — or here's the provisional Ashburton Live Calender. 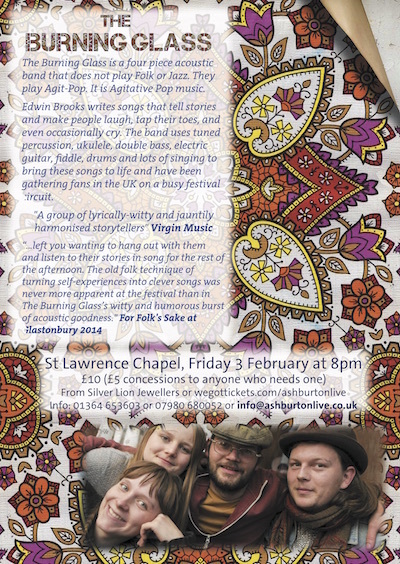 On Friday 3 February there is mellow, folky ‘agit-pop’ band The Burning Glass, who play ‘agitative pop music’ and can also be very silly, in a brilliant Pythonesque way. Edwin Brooks writes songs that tell stories and make people laugh, tap their toes, and even occasionally cry. The band uses tuned percussion, ukulele, double bass, electric guitar, fiddle, drums and lots of singing to bring these songs to life and has been gathering fans in the UK on a busy festival circuit. 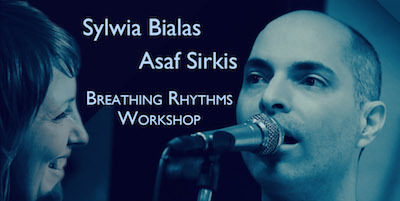 The following weekend the amazing drummer, percussionist, composer and educator Asaf Sirkis is bringing his 'International Quartet' with singer, composer and educator Sylwia Bialas to perform songs from their latest album, ‘Come to Me’. The album contains some really gorgeous music, with songs in her native Polish from Sylwia Bialas. Asaf recently played at Ronnie Scott's in London behind sensational young singer/pianist Jacob Collier. They will also be running two workshops, one on Saturday for musicians playing together, and 'Breathing Rhythms' on Sunday, for anyone who ever sings or plays, at whatever level. This looks like being truly stunning, and will wake you up to new possibilities whether you're a seasoned pro, or sing in a local choir and don't read music. Although the workshop uses the voice, it’s definitely not just for singers. Asaf Sirkis Band Workshop — Saturday 11 February, 2-5pm, £20 (concessions £10), email info@ashburtonlive.co.uk or call 07980 680052 for more info or to register. Breathing Rhythms (workshop) — Sunday 12 February, 1-4pm, £20 (concessions £10), Ashburton Methodist Hall, West St, TQ13 7DT Booking now open at wegottickets.com/ashburtonlive, or in person at Silver Lion Jewellers, North St, Ashburton. Tickets for all concerts, £10 (£5 concessions to anyone who needs one) from wegottickets.com/ashburtonlive, Silver Lion Jewellers, North St, Ashburton or on the door. Reservations: info@ashburtonlive.co.uk. Past Concerts: Details of past events here. Recordings of some recent concerts can be heard here on the Ashburton Live Mixcloud page. There are some great moments here. Do listen and leave comments. Parking in street or car park behind Town Hall 2 mins walk away. Some spaces also available along the short lane between the Silent Whitle Pub and the Station garage oppoite the Greymatter office — despite the warning signs, we are welcome to park there in the evening. For food, The Silent Whistle Pub at the end of St Lawrence Lane is almot opposite the venue. There's a good range of pub food avaiable there. Give them a all on 01364 654700.